I wanted to use this recipe, in keeping with my declaration to start testing some of the recipes I’ve tagged on delicious. Unfortunately, reading through it and looking through my kitchen – I don’t regularly keep pasteurized eggs in the house, and I wasn’t really thrilled on using uncooked eggs in a refrigerated pie. So I followed the recipe in my BHG cookbook, which is similar (to a point) to the recipe that the author recommended for a cooked recipe. The French Silk pie here is like many things in life: a little extra work, but very much worth every bit of effort. There is, of course, the baking of the empty crust on its own, since you don’t bake the filling. Making the filling reminded me of ganache in the beginning (because it is) and a custard at the end (because it is). Then there’s the use of an ice-water bath to set up the filling and beating the filling until it’s light and fluffy before spreading it into the crust. BHG tells you to cook the filling on direct heat; I took the safe route and made a double boiler to create the ganache and thicken the final mixture. Also, in the future, I’ll mix semisweet with milk chocolate – the pie as is written here is super-rich and very good, but almost too rich for our tastes. The worst part is probably the waiting. Who ever heard of waiting 5-24 hours for a slice of pie?! But oh, it’s worth it. So very worth it. paraphrased from the Better Homes and Gardens Cookbook, 12th ed. Prepare the pastry shell and set aside. 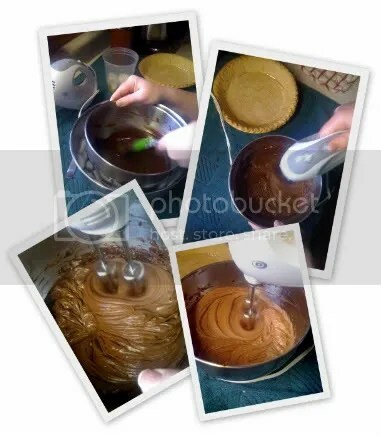 In a medium saucepan, combine the 1 cup whipping cream, chocolate, butter and sugar and cook over low heat (OR combine the 1 cup whipping cream, chocolate, butter and sugar in a metal or glass bowl and cook over a medium saucepan with 1″ of water on medium-low heat) until chocolate is melted. Remove from heat and temper your egg yolks with the chocolate mixture carefully. 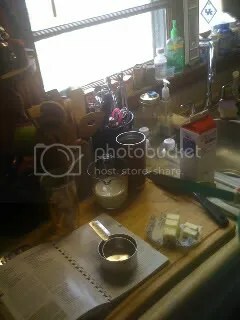 Return egg mixture to remaining chocolate mixture and return saucepan/double boiler to stovetop. Cook over medium-low heat, stirring constantly, until mixture is slightly thickened. Remove from heat, stir in crème de cacao or whipping cream and place the saucepan/bowl in an ice bath, stirring occasionally until the mixture thickens and is hard to stir (20-30 minutes). Transfer mixture to a medium bowl (if necessary) and beat cooled mixture on medium to high speed for 2-3 minutes or until light and fluffy. Spread filling in pastry shell, then cover and refrigerate pie a minimum of 5 hours. To serve, top with whipped cream, and, if desired, chocolate curls. Keep in mind that the double boiler will produce a perfectly desirable result without worrying about the possibility of scalding the cream. If you cook it over direct heat, the cookbook tells you that after the second cooking before you mix in the crème de cacao, the mixture may separate, and that’s okay. I didn’t have that problem with the double boiler. Other than that, enjoy your French Silk pie with someone you love—or hoard it all for yourself. Either way, it’s divine. 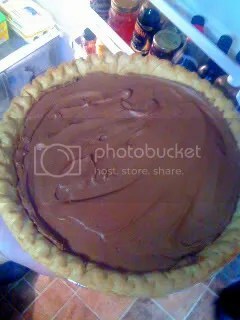 This entry was posted in Uncategorized and tagged Baking, Chocolate, Dessert, From Scratch, Pie by Kate. Bookmark the permalink. Thank you. I have this recipe in my cookbook at home and I wanted to make it while away at my parents. It is generally unavailable on the internet until I found your site. Love the recipe! Thanks for sharing! So I’m curious here about pasteurized eggs. I honestly never realized people put eggs through a pasteurization process. Are typical store bought eggs normally pasteurized or are they raw? I get my eggs from a CSA but I actually don’t know if they’re pasteurized or not – I never thought to ask because I’d never heard of it before. Honestly, I’d never considered pasteurizing eggs either, although I vaguely remember hearing about it in an ice cream discussion at one point some time ago. Store-bought eggs are not generally pasteurized, though then again fresh eggs aren’t either. Pasteurized eggs should be clearly marked on the carton, and price will generally reflect the extra input cost. I wouldn’t use them for just anything, though you can, of course, but would stick to using them for unbaked pies, cookie dough to be eaten for the sake of being cookie dough (or put into ice cream), etc. BTW who does your photos they’re wonderful, remind me of a professional. Yes we are dear well known for the wonderful decisions we make and that Pi(e) was awesome.